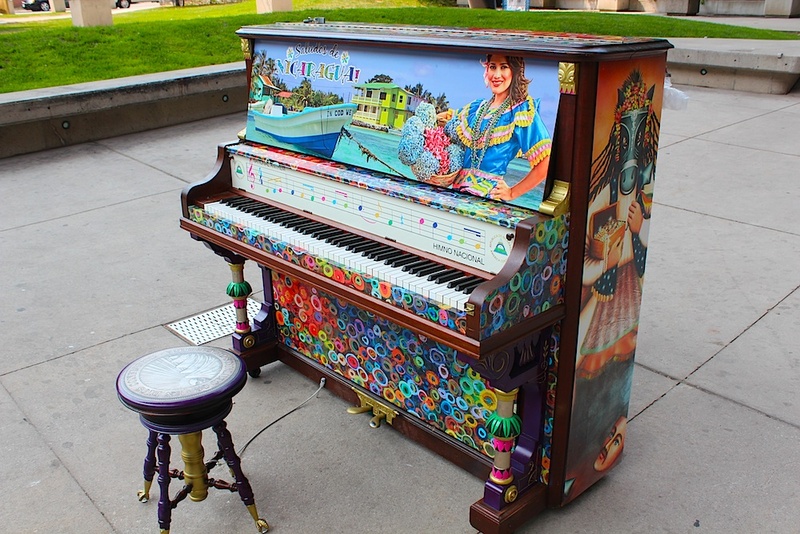 Recently, 41 vibrant pianos appeared all over Toronto as part of the Play Me, I'm Yours event. An art installation encouraging the participation of the community, it is a kick-off to the 3 year countdown to the 2015 Pan Am Games, to be held in Toronto. The pianos were designed by artists from each of the participating countries; they are beautiful. Now, some people might simply appreciate the artistry of each design. Some may take a seat & play a little something if there's nobody around. Some might take the opportunity to share their talent & entertain. But that's not quite enough fun for my friend, Andrew. Andrew Mitchell played & sang Gavin DeGraw's "Not Over You" on 10 different pianos around the city, then edited the filmed performances together. In 2 minutes, visit Guatemala, Brazil, Suriname, Aruba, Cuba, Canada, The Bahamas, Haiti, Jamaica & Honduras, courtesy of Andrew! I roll with talented people, what can I say? To learn more about Play Me, I'm Yours & if it's headed to your city next, go here. 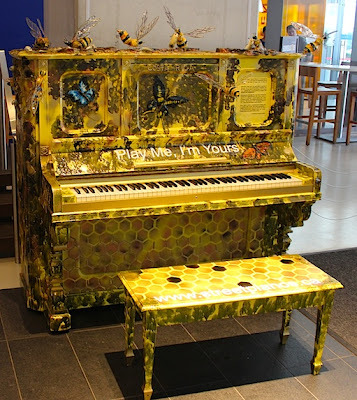 To see some great photos of the pianos featured in Toronto, go here. To learn more about Andrew Mitchell, I will tell you he's awesome, & the only thing that could have made this video MORE awesome is if he had been wearing his rebel/Che Guevara costume from a production we were both in. I suppose Che singing "Not Over You" at the Cuban piano would have been disturbing, so...good call on the casual look, Andrew. Written By a Kid is a new series by Geek & Sundry that transforms a story told by a child into a short film. It's live-action, animated, stop-motion, & FUN. I love this first installment, starring Joss Whedon as the leader of the "S.Q.U.A.T. Team". I'm sure the kid was thinking of S.W.A.T., but this is MUCH funnier. Hilarious & creative & bonus Kids In The Hall cast member & love love love. Check out other videos (costumes, casting & a "making of") here. Watch this compilation of times Mr. Wizard is snarky towards the children on his show. It is amazing. "Kantor’s amuse-bouche was something of a (dry) ice-breaker: a white blob plucked out of a cauldron of liquid nitrogen, to be consumed whole; the freezing substance quickly dissolving into a film of lime-flavoured meringue. 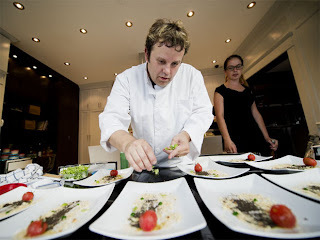 The dish was named after the song Limelight, not only because of its ingredients, but also because eating it was a performance — everyone was eager to see the smoke coming out of their fellow diners’ noses." "The song Red Barchetta, about a joyride in the future when cars have been outlawed, became a deconstructed red bruschetta where a tomato, shiny like a polished racecar, seemed to have burned black-olive rubber through a “dirt road” of breadcrumbs." 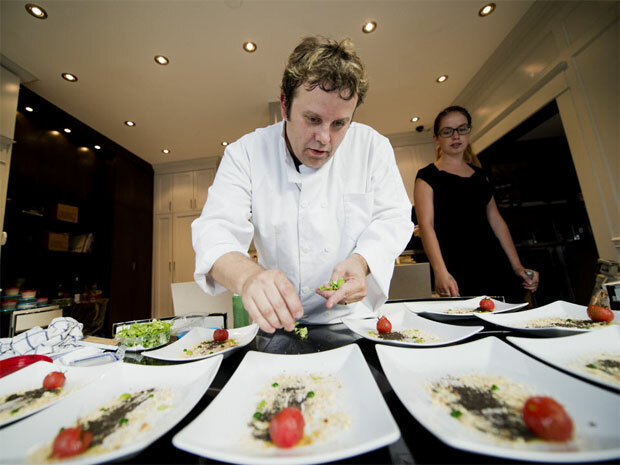 To read more details of this very creative meal, like the complex "La Villa Strangiato" dish, read the full article here. Improv Everywhere is a comedy troupe that began with a Ben Folds Fake prank that I had read about several years ago. They haven't stopped creating scenes since then - their website boasts of over 100 missions involving tens of thousands of people in on the joke, or "undercover agents". Their latest scene transformed a family miniature golf outing into a major sports event - complete with fake ESPN coverage, caddies, a gallery, & the actual Claret Cup, just hoisted by the winner of this weekend's British Open, Ernie Els. The commentary is hilarious: "Max, of course, sponsored by Star Wars", & I love that the champion is greeted by a fake family. Well done. Watch more scenes created by Improv Everywhere here. 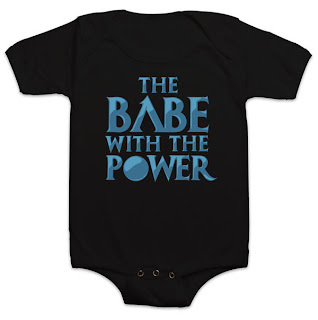 I saw this shirt at thinkgeek about 9 months ago & immediately had to order it for my niece, who was yet to be born. Labyrinth was on a steady rotation when my brother & I were young, so his baby had to have this. You're reading this blog, so I assume you get the reference, but I see no need to NOT post this awesome clip full of awesomeness so you can have yourself a dance party. Clearly, I am the nerdiest of Lily's 2 Aunts, as her Aunt Lindsay writes a wonderful blog about normal adult things like home renovating. The onesie is also available as a women's shirt, & you can buy them both here. Look how cute it looks on Lily! She's working on her Goblin King hair. So far, I've resisted the urge to toss her 20 feet into the air & wait for a Muppet to catch her. So far.